Five new national conservation NGOs have joined the BirdLife Partnership, the largest and fastest-growing international nature conservation Partnership, bringing the total number of countries and territories represented to 121. “These are exciting time for the BirdLife Partnership, and with the accession of these new BirdLife Affiliates, we are roughly two-thirds of the way towards our ambition to be represented in all countries and territories of the world”, said Dr Marco Lambertini, BirdLife’s Chief Executive. Two of the new BirdLife Affiliates -NatureFiji-MareqetiViti (Fiji) and GREPOM/BirdLife Maroc (Morocco) take over from BirdLife Country Programmes run respectively by the BirdLife Pacific Partnership and SEO/BirdLife (BirdLife in Spain). Three- the Bird Study and Protection Society of Serbia (BSPSS), Centre for Protection and Research of Birds of Montenegro (CZIP), and Ugura BIOM (Croatia) – join from the Balkans, following a decade of capacity-building work involving BirdLife Partners from elsewhere in Europe, including Hungary and Switzerland. This provides yet more evidence of the success of BirdLife’s “Partners supporting Partners” system, whereby established BirdLife organisations support new and developing ones. Late in 2012, the BirdLife Pacific Partnership officially transferred responsibility for the activities previously managed by its Fiji Country Programme to NatureFiji-MareqetiViti (NFMV), Fiji’s only national nature conservation organisation. Though barely five years old, NFMV has already established itself independently as a formidable force for conservation in Fiji, taking the lead in action for the Pacific state’s threatened species, raising awareness of the value of Fiji’s unique biodiversity, involving landowners and businesses in more sustainable activities, influencing policy and steering government actions, and attracting support and funding from institutions and corporations from across the world. BirdLife first established a presence in Fiji in 2002. From the outset, the intention was to support the emergence of a fully autonomous, self-financing civil society membership organisation. NatureFiji-MareqetiViti was launched on 30th June 2007, as the working arm of the Fiji Nature Conservation Trust. Its mission is “to enhance biodiversity and habitat conservation, endangered species protection and sustainable use of natural resources of the Fiji Islands through the promotion of collaborative conservation action, awareness raising, education, research and biodiversity information exchange”. GREPOM/BirdLife Maroc (Groupe de Recherche pour la Protection des Oiseaux au Maroc ), the new BirdLife Affiliate in Morocco, was established in 1993 by a group of ornithologists, researchers and bird enthusiasts, to protect Morocco’s birds and other natural heritage. The BirdLife Partnership has been active in Morocco for more than 15 years through a Country Programme managed initially by BirdLife International, then by the RSPB (UK), and most recently by SEO/BirdLife (Spain), with the engagement of other BirdLife Partners, especially VBN (Netherlands), and the BirdLife Africa Secretariat. Since 2010, BirdLife and the Moroccan NGO have been working together to develop the capacity and governance structure required for GREPOM to qualify as a BirdLife Affiliate. In September 2012, GREPOM’s General Assembly unanimously ratified the amendments to its bylaws that made it eligible to join the BirdLife Partnership. In line with BirdLife’s 2020 Strategy, GREPOM’s strategic objectives include becoming the reference point for national and international decision-making on birds and their habitats in Morocco, developing a programme of management and action for all Morocco’s IBAs by 2020, and being recognised by all national agencies and institutions responsible for the conservation of Morocco’s natural heritage. The Bird Study and Protection Society of Serbia (BSPSS) was established in 1989, by professional and amateur ornithologists from the Serbian Province of Vojvodina (it was first called the Bird Protection and Study Society of Vojvodina). In 1997, the Society consolidated and began to expand. Membership increased, and the society began to take on project work funded by international donors. 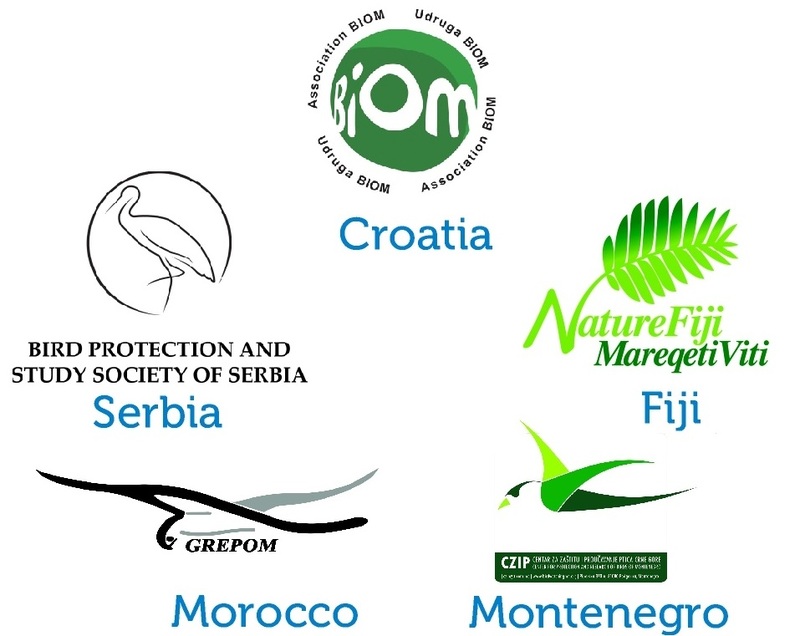 In 2006-7, BSPSS received help with capacity building, including management training, cross-border cooperation in active bird protection, and promotional materials publishing and distribution, from MME (BirdLife Hungary), which provided similar support to the new BirdLife Affiliate in Montenegro. Following the General Assembly of December 2010 the Serbia-wide name was adopted, and BSPSS began to make the changes needed to join the BirdLife Partnership. BSPSS maintains a network of active members throughout Serbia who work on bird and habitat conservation, and gather data about birds in Serbia at local, regional and national levels. BSPSS promotes the value of IBAs in rural regions and among young people, and is involved in various cross-border activities with other BirdLife Partners in the region, including the Adriatic Flyway project. The Centre for Protection and Research of Birds of Montenegro (CZIP) was founded in 2000 by professional ornithologists and researchers from Montenegro’s Institute for Nature Conservation, Natural History Museum and National Parks, and students of the Faculty of Biology in Podgorica. From its formation onwards, the new Montenegrin BirdLife Affiliate has worked in close cooperation with BirdLife, and was a natural candidate to join the Partnership, along with the two other new Balkan Affiliates, at this year’s World Congress. CZIP’s mission is to protect and monitor birds and their habitats, conserve Montenegro’s Important Bird Areas, educate and raise public awareness of birds, biodiversity and the the environment, make birdwatching more popular (CZIP also uses the alternative name, Birdwatching Montenegro), and to cooperate with other nature conservation organisations within Montenegro, the Balkans, Europe and globally. Udruga BIOM (Association for Biological Research) becomes the BirdLife Affiliate for Croatia. Founded in Croatia in 2006, it focuses on scientific and professional research and protection of flora, fauna and habitats. Its activities contribute to awareness-raising on topics related to biodiversity, habitats in danger and sustainable development, while promoting Biology as a scientific discipline. BIOM monitors raptors in protected areas throughout Croatia, and conducted the first Croatian rat eradication to protect tubenoses on small Adriatic islands. Other work includes updating the Croatian Biodiversity Database, baseline studies for protected area and EU NATURA 2000 site management plans, and species action plans. All BIOM projects involve working with the general public when possible, and include educational activities and materials. Before becoming BirdLife Affiliate, BIOM managed BirdLife’s Spring Alive project in Croatia. BIOM has good working relationships with conservation organisations elsewhere in the Balkans, including the BirdLife Partners and Affiliates.